Located in the Saurashtra peninsula, Rajkot is closely associated with the early life of Mahatma Gandhi whose father was the Dewan (Chief Minister) of the princely state of the same name. One of the major commercial cities in Gujarat, Rajkot, situated on the banks of the Aji and Nyari rivers, is littered with the remnants of the past. 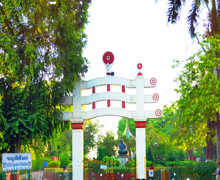 Jubilee Garden, Mohandas Gandhi High School, Kaba Gandhi No Delo, Watson Museum, Lal Pari Lake, Ramkrishna Ashram and Aji Dam are the prime attractions for visitors to this fourth largest city in the state. One of the main attractions of Rajkot, the Watson Museum has a collection of archaeological artefacts, sculptures collected by Colonel John Watson, after whom it is named. John Watson was the political agent of the British in the Kathiawar in the 1880s. It remains closed on 2nd and 4th Saturdays of the month and public holidays. A major sightseeing attraction in Rajkot, Aji Dam has been created on the Aji river to supply drinking water to the Rajkot city. The place is visited for its zoo, amusement park for children, an aviary and a crocodile park. One of the prime tourist destinations in Rajkot, the huge Race Course Ground is a stretch of field and home to several playgrounds of different games and sports like cricket, football, hockey and volleyball. Dotted with attractions like Bhavan, Children's Traffic Park, Fun World, the Race Course Ground is a centre of leisure and entertainment for the people of Rajkot. It is a must visit for any visitor to the city. 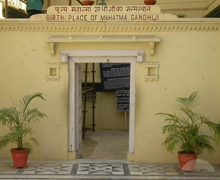 Located off the Gheekantha Road, Kabe Gandhi no Delo is the ancestral home of Mahatma Gandhi where he had spent some years of his childhood here. Visitors who travel to Rajkot set off for this address. 5 km from the Rajkot city, Lal Pari Lake is the favourite haunt of the picnickers. The serene environs provide perfect habitat for resident and migratory birds including black tailed godwit, rosy pastor, wigeon, pheasant tailed jacan, purple moor hen, common teal, pelican and spoon bill. An oasis of tranquillity, Ramakrishna Mutt attracts visitors who are willing to known about Shri Ramakrishna Paramahansa, guru of Swami Vivekanand. 14 km from Rajkot on the Morbi road, Manas Mandir is a renowned sacred destination. This is the site of the famed Ramdev Pir temple in Rajkot district. 38 km from Rajkot is located the erstwhile princely state of Gondal which is famous for its palaces, and temples. While Riverside Palace, Naulakha Palace and Huzoor Palace are famous palaces, Aksharpuroshottam and Bhuwaneshwari Devi temples are sacred places in Gondal. Once the seat of a princely state, Wankaner is 50 km from Rajkot. The place i home to a beautiful palace (Wankaner Palace) and a temple. 75 km from Rajkot is located the sacred shrine of Trinetreswar at Tarnetar which finds itself at its exubereant best during the annual fair held here beginning on the fourth day of the first half of Bhadrapada month (Ganesh Chaturthi day). The colourful fair is marked by folk dance and music . Even today the fair plays venue for the marriage of boys and girls. Located at a distance of 60 km from Rajkot, Bhid Bhanjan is a popular excursion site from Rajkot. Bhid Bhanjan is noted for its Jain shrines decorated with intricate carvings. 53 km from Rajkot, Virpur is a pilgrim centre in Gujarat. It is the birthplace of Jalaram Bapa a great social reformer and founder of the Jalaram movement. Jalaram temple is the chief attraction of Virpur which is at a short distance from Gondal . Khambalia near Virpur is noted for Buddhist relics. 78 km from Rajkot, Morbi is a scenic riverside town known today for its tiles, ceramics and clocks. Situated on the banks the Machhu river, Morbi was the capital of an erstwhile princely state. 80 km from Rajkot and 180 km from Ahmedabad, Hingolgadh Nature Sanctuary is an important destination for woildlife lovers. Ocupying an area of 6.54 sq. Km, the sanctuary is home to a wide range of animals and reptiles. The Chinkara, Wolf, Bluebull, Jackal, Foxes, Indian Hare, Indian Porcupine, Hyena and Flying foxes are found in the sanctuary. The sanctuary is also rich in avain poprlation. . Almost 230 different kinds of birds can be spotted here. Chief among the resident birds are Red-vented Bulbul, Spotted Dove, twittering Green bee-eater and Wood Pecker. Among the migratory birds Kunjand Flamingo is the main attartcion. 187 km from Rajkot is Porbandar which is the birthplace of Mahatma Gandhi, the Father of the Nation. This picturesque seaside town in Gujarat should be visited for enjoying the seashore and honouring Gandhi by visiting his birthplace. Best time to visit Porbandar is from November to March. How to Reach Rajkot by Air: The city’s airport is connected by flights from major cities like Mumbai. 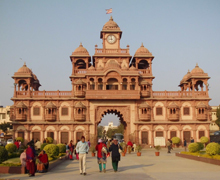 How to Reach Rajkot by Rail: Rajkot is a major railhead connecting several important cities in India. 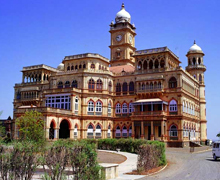 How to Reach Rajkot by Road: Rajkot is easily approachable by regular buses, taxis from different places in Gujarat. Some of the cities and places in Gujarat connected with Dwarka by road are Jamnagar (92 km), Junagadh (101 km), Bhavnagar (178 km), Porbandar (187 km), Dwarka (238 km ) and Ahmedabad (255 Km). Being a famous industrial and fast growing city, Rajkot has a wide array of accommodation options to choose from. The Imperial Palace, Hotel Kavery, Hotel Silver Palace, Hotel The Grand Regency, Chouki Dhani, Hotel Aditya, Hotel Samrat International, Hotel King Palace, The Galaxy Hotel, Hotel Harmony, Hotel K K International, Ashok Hotel, Jayshree Guest House, Jyoti Guest House, Hotel Ruby, Shri Murlidhar Lodge and Guest House are some of the accommodation options in Rajkot. Your visit to Rajkot isn't quite complete without having shopped for embroidered fabrics, bandhnis, beadwork and readymade bangles which can be found at the Bangdi Bazar situated in the old part of Rajkot. The shops here sell bangles of every form, shape, and colour which has earned the market its name.